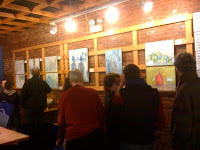 Last Monday, I was invited to a showing at Toscanini's in Central Sq. at, pretty much 8 on the dot, there were already a handful of people there for the art function, including 'Famous' Gus, the owner. The artist, Julia Soyer, had an entire wall set up to show her work. There was an excellent spread of cheeses, fruits, and snacks. Wine, coffee, and even maybe the best ice cream on earth was served as well. 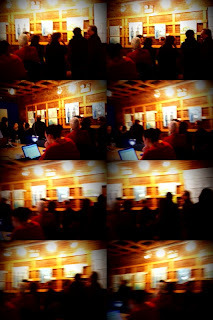 I thought it was a brilliant place to host an art showing. Being a popular coffee shop allowed for a steady influx of random visitors. The atmosphere was really friendly and the crowd continued to grow livelier as the night went on. I really hope that they coninue to have more local artists showing and selling their art here. There aren't many other ways to enjoy a Monday night quite like this.